Her father is the chairman of the Brooklyn Improvement Company, founded in 1866 by Edwin C. Litchfield, the bride’s maternal great-great-great grandfather, to create the Gowanus Canal. The company now manages the financial affairs of the descendants of Mr. Litchfield. At one time, Mr. Litchfield owned all the land from 1st Street to Ninth Street and from the Gowanus into what is now Prospect Park. 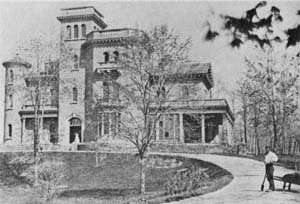 Litchfield Villa, which is at Prospect Park West and Fifth Street was one of his homes. (The little building that stands at the corner of Third Avenue and Third Street next to the Whole Foods site was the headquarters of the Brooklyn Improvement Company.) We had no idea there was still a Brooklyn Improvement Company. Best wishes Emily and Christian.